Tests have revealed that the 233 swans found dead in a lake in north China's Inner Mongolia autonomous region had died from chemical poisoning, likely at the hands of poachers, local authorities said Tuesday evening. Carbofuran, a kind of pesticide, was detected in samples taken from the dead birds, according to the information office of Zhenglan Banner government. An initial investigation found evidence that indicated that these birds were killed by poachers. The investigation is ongoing. The local government has also started to safely dispose of the dead birds and launched a review of the local environment as well. In addition to the swans, 26 mallards were also found dead in the lake in Xilingol League, according to the information office. Photos of the dead birds, which had been removed from the water by herdsmen, were shared across social networks on Sunday. The league has increased the number of patrols in areas frequented by migratory birds and rolled out more stringent rules for poultry markets. About 300 km away from Beijing, the lake is a migratory stop for swans. 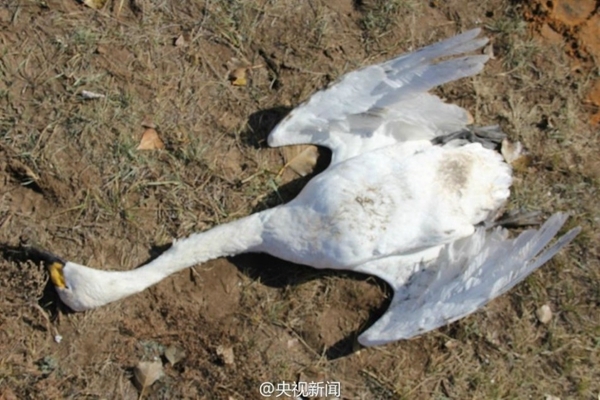 Tests revealed that the 233 swans found dead in a lake in Inner Mongolia had died from poisoning.